Kingdom of Night is an 80s-themed isometric, story-driven, action RPG with an expansive, interconnected map and open-ended quest system. It is a game about coming of age, cosmic horror, and true love. The player takes control of John, as his adventure leads him through an hour by hour experience of what may be everyone’s last night on Earth. He will encounter unearthly evils, Demon lords, afflicted townsfolk, high school bullies, and a torrent of engaging, serial-like side stories all nested in a larger than life fantasy that brings the ultimate evil to a neighborhood near you. Choose your class, battle nightmarish creatures, customize your abilities, collect unique items and equipment in order to infiltrate the massive lairs of the Demon Lords and take on apocalyptic boss battles at their very centers. Its 198X in the small town of Watford, Arizona. A strange cult has been working late hours to contact The Great Beyond. In their ignorance they have made contact with an ancient evil. Now, after waiting for patient millennia, The Demon Lord Baphomet has stepped through their gate and into their world. In order to remain on the earth Baphomet must take an earthly bride before the sun rises. The demon king has set his evil eye on your neighbor Ophelia. Crashing through her window in the dead of night he spirits her away to his fortress Leviathan. With mere hours to complete the perverse ritual of demonic wedding, Baphomet hides above the town secure behind the protection of his Demon Generals. Now in the twilight hours before dawn, while the dead rise from their graves and demon’s wreak havoc in the streets, you must unseat the Generals from their demonic strongholds and pursue Baphomet into his fortress to rescue Ophelia before it’s too late. Don't you want to be a giraffe detective? Sheffield, UK - 17th April 2019 - Charlotte Sutherland, solo Developer at Cave Monsters, has today announced the relaunch of the Kickstarter for Lord Winklebottom Investigates for PC, Mac, Linux and Nintendo Switch. Lord Winklebottom is a classic point and click adventure with a fetching hand drawn art style and a jolly good sense of humour! Set in the roaring ‘20s, the world’s foremost giraffe detective is about to embark on his most challenging case yet. A mysterious invitation to an isolated island results in a grisly murder and a race against time to track down the killer. Thankfully, there’s nobody better to crack the case than the great detective and gentleman, Lord Winklebottom. Join Lord Winklebottom and his steadfast companion, Dr Frumple as they investigate the murder of their old friend. Uncover clues, interrogate suspects and solve puzzles to crack the case. 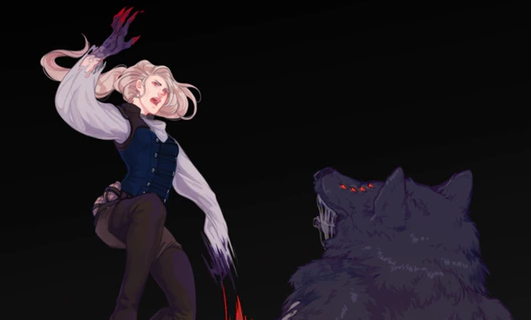 Our daring detective will put his neck on the line to capture the killer and uncover the horrifying dark secret at the heart of the Isle of Barghest! “Lord Winklebottom is homage to detective stories, particularly those set in the late 19th and early 20th centuries, such as Sherlock Holmes, Agatha Christie and the Paul Temple mysteries.” said creator Charlotte Sutherland, "I'm really excited to bring the strange world of Lord Winklebottom and its bizarre cast of anthropomorphic animals to life, and can't wait for people to get the chance to play it”. Cave Monsters is looking for £7,000 to help with a Kickstarter campaign that will last 30 days - April 17th – May 17th. The fund will be used to get the game fully voice acted to a high standard, collaborate with a composer to create a unique, 1920’s inspired soundtrack, programming assistance and additional localisation. As well as a lower price for the game, the newly-relaunched campaign features some brand new rewards, including a 90s retro-style big box edition for PC. The game will be released on PC, Mac, Linux and Nintendo Switch™ in Q2 2020. Three more Kickstarter projects have hit their funding goals, which means three more games for Switch! Prodeus has easily cleared its goal of $52,500, and there's still time left to scrape together some funds for stretch goals. Zombiotik has surpassed its goal of $3,752, which means it'll be making its way to Switch in the future as well. Finally there's Hunt the Night, which technically hasn't hit its goal just yet. The game is just $823 shy of hitting its goal, and it has 19 days to do so. That seems like a done deal to me, but don't let it stop you from clicking over and backing the project! Yes, the Game Boy Color! Taking the cat for a walk with a balloon wasn't the best idea after all! After an unfortunate accident, the girl's pet friend went floating into the atmosphere and she needs to go skyward to save her furry companion. She must now jump, stomp, dash and flap her arms to maneuver around perilous obstacles while racing against the clock to retrieve her pet friend before it is too late! Tobu Tobu Girl is an arcade-style platforming game for Game Boy® that will challenge even the most skilled players with new, randomly generated obstacle patterns in each run. The game will enchant you with its beautifully crafted pixel art, tight controls and an earworm-inducing 8-bit soundtrack. Longivity is ensured with unlockables, various difficulty levels, battery backed-up highscores and motivating scoring mechanics. If you'd like to help bring this original, 2017 Game Boy title to the Game Boy Color, you can kick in some cash for the project right here. We knew the relaunch of the Grand Guilds Kickstarter was on the way, and now things are up-and-running. It appears the Kickstarter is going well, as more than half of the $12,000 goal has already been amassed. You can kick in your contribution right here. What is the grip clip? 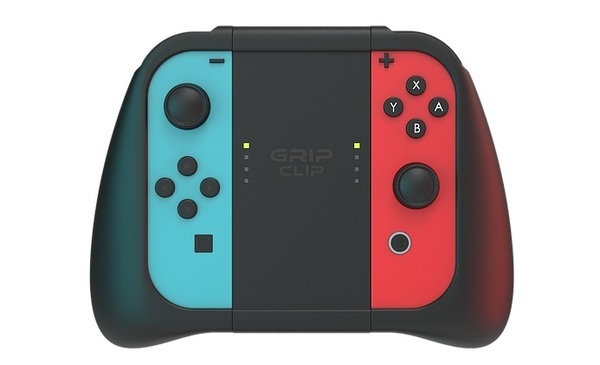 The Grip Clip™ is an ergonomic accessory that clips to Joy-Cons™ and transforms them into controllers that feel truly amazing in your hands. Transform your Joy-Cons™ into a full sized gaming controller with the Grip Clip connector. The Grip Clip design allows it to be used in handheld mode too! Say goodbye to cramping hands and aching wrists. If the Grip Clip seems like a project you'd like to back, you can click here and enter in your email address to be notified of the Kickstarter's launch. Could this be the next game you back? Warped: Metaverse is a 3D Action-Adventure game that challenges players to use interesting mechanics learned through the course of the game to defeat enemies and save the world. Players interact with the world through Jay, a hero chosen by fate to stop Kreinold, a villain bent on causing mayhem. If Warped: Metaverse does get funded, not only will their be a Switch release via the eShop, there will be a physical copy as well. You can kick in some cash here. Roosevelt Games LLC is proud to present GODS, a multiplayer RTS/RPG god game for PC, XBOX One®, PS4® and Nintendo Switch®. It supports Oculus Rift®, HTC Vive® and PSVR®. The company will release GODS in the third quarter of 2020. In GODS, the players can build a civilization, fight enemy gods, raise powerful creatures and take part in multiplayer games (e.g., death matches, two vs. two or creature battle tournaments). Also, the players can possess an actor to complete his/her quests from a third-person RPG-style game-play. According to the CEO, "It's been a while since the fans had a chance to play a god game in console devices or with VR support. We added unique elements, stories and various VR specific experiences. Any additional funds will support the rest of the game development, hardware, testing, marketing and miscellaneous fees." Test Your Might -- Battle against 10 enemy gods. A Rich, Captivating Narrative -- Story mode takes players through at least three islands. A Diverse Experience -- Each land features at least 20 characters and each character features three-five quests or challenges. More Role-Playing -- Players can possess any actor in the game and play from a third-person view. Ultimate Diversity -- There are Halflings, Wizards, Dwarves, Elves, Orcs, Egyptians, Vikings, Greeks and the Romans. Their physical features, behavior and capabilities are random and result from a combination of their parents. Absolute Wonders -- Mighty Lion, Tiger, Wolf, Dragon, Elephant and the Cyclops creatures are confirmed. The public can see the game-play videos, screen-shots and get up-to-date news on YouTube or the GODS Facebook page. With just 20 days left in this campaign, the support from the public is urgently needed. Consider getting involved and help "GODS" become the best god game possible. Zombiotik is a 3D local multiplayer video game based on tag and created by Totema Studio. It can be played by up to 8 players simultaneously. Zombiotik offers a quick and exciting experience to all levels of gamers with it’s simple controls and mechanics. Zombiotik has a very modest goal of less than $4,000, and it's more than halfway there as of right now. If you think this project looks like it's worth funding, check it out here! Thanks to Elfteiroh for the heads up!